Prepared for a successful exhibition! We have finally arrived to München Transport Logistic 2015! 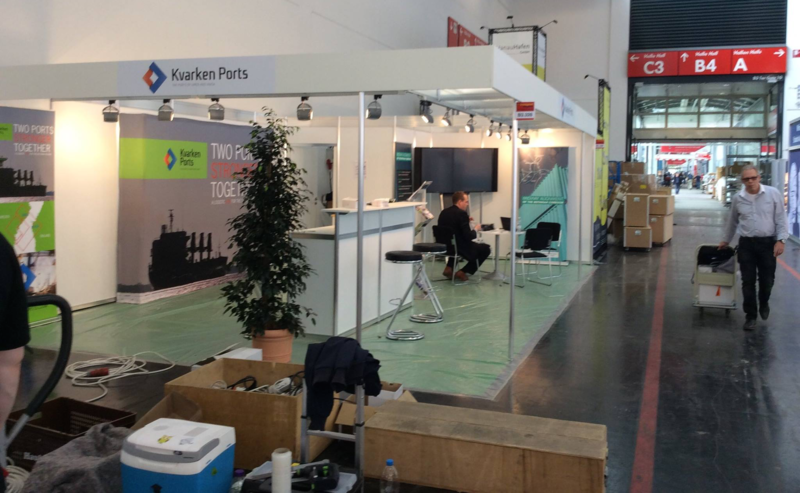 Midway Alignment’s and Kvarken Port’s joint exhibition stand B3 328 is installed and we are ready. – We have been preparing for this since early spring. Having a stand at such a big event demandes weeks of organizing and planning. Our stand material was for example shipped last week by car and boat together with our Finnish exhibition partners, tells Logistics Expert Anna Måtts. This exhibition for logistics, mobility, IT and Supply Chain Management brings together industry experts and investment decision makers from all over the world. It is a comprehensive platform where the most important issues affecting the industry today are discussed and where new innovation potential is brought to light. – Despite the fact that the main focus lies on bigger countries, there is a wealth of smaller countries and regional specialists represented, giving insight into different regions around the world. Some 50 exhibitors are from Finland, Sweden and Norway, presenting ports, logistics operators, development companies and transport administrations. Therefore, we as a port and a project in the north also have our own audience and partners that we can reach out to at this event, reflects the port’s Managing Director Matti Esko.